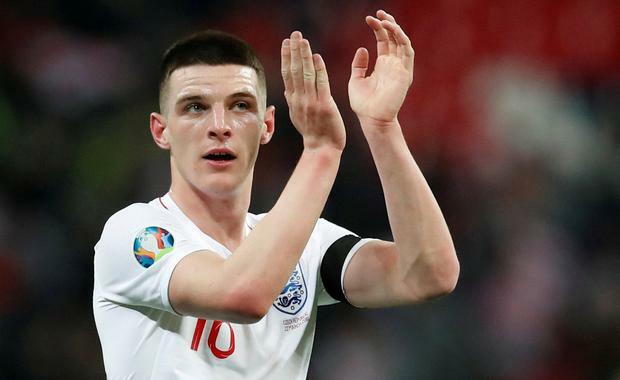 Declan Rice has hailed his England debut as 'a special night' after he confirmed his switch from the Republic of Ireland international ranks by appearing for the country of his birth at Wembley on Friday night. Rice, who won three caps for Ireland before switching his allegiances to England earlier this year, made a second-half substitute appearance for Gareth Southgate's side, as they beat the Czech Republic 5-0 in a Euro 2020 qualifier. His appearance came a day after a tweet that appeared to show his support for the IRA back in 2015 resurfaced, with Rice putting that controversy behind him as he saluted his first night in England colours. "I'm really happy, as you can see," Rice told West Ham TV. "To make my debut in front of 80,000 fans and to have my family here, my girlfriend, my brothers, it's special. To get the victory as well, I can't really put it into words, but it's a special night. "This week has been crazy. It's been really surreal, to be honest. I knew I'd be coming into a great camp, with a great manager and great players. "Training has been good; the standards are very, very high. Coming to the game tonight, my first time with England at Wembley, it's a special moment. To get out on the field for half an hour has just put the icing on the cake." Rice offered up similar sentiments after he made his senior Republic of Ireland debut against Turkey in March 2018, as he confirmed his commitment to Ireland after the offered up these comments as he sang Amhrán na bhFiann before the game and stated: "It brought a little bit of a tear to my eye singing it and thinking of my nana and grandad. It was a special moment." Rice also offered up words of praise for England boss Southgate, who called up the 20-year-old midfielder after his international clearance was fast racked through to allow him to play in these Euro 2020 qualifiers. "You hear a lot of stuff about how good he is at man-management and how he is with the players, and I have to say he has been top drawer with me," added Rice. "He gives you the confidence to go out and play, and he wants you to express yourself. "You see tonight he gave Callum Hudson-Odoi his debut as well. He is not afraid, and I think that is really good for the young English players coming through."